It may be all fun and games for most participants in the 66th Annual Downtown Santa Barbara Holiday Parade, presented by Consumer Fire Products Inc., but for two specific kids, the parade comes with a great deal of responsibility — lighting the huge community Christmas Tree to open the parade. The process is one of many traditions of the Holiday Parade which takes place at 6:30 p.m. Friday, Dec. 7. Kids (ages 6-10) can submit an original sketch, drawing or painting, using drawing tools of their choice, representing the 2018 Parade theme, Santa Barbara Shines. After the judging process, calls are made to the two winning artists with the proclamation: You have been chosen to lead the Holiday Parade and light the tree. Downtown Santa Barbara Office, 27-B E. De la Guerra St. The Prince & Fairy application deadline has been extended to 5 p.m. Wednesday, Nov. 14. Winners will be announced on Friday, Nov. 16. Please enter the drawing contest only if your child can participate in the Dec. 7 Holiday Parade with a 5:30 p.m. call time. The prince and fairy must also be available for radio interviews at 8 a.m. that day. This year’s Prince & Fairy sponsor is adding a fashionable incentive for the community’s young artists. 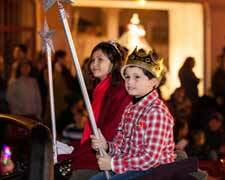 “Paseo Nuevo is thrilled to sponsor the Prince & Fairy Art Contest this year in support of Downtown Santa Barbara’s 66th Annual Holiday Parade,” said Mary Lynn Harms-Romo, Paseo Nuevo marketing manager. “The long-held tradition for locals and visitors is a vital part of our community and we are proud to be a part of it,” she said. “This year, we are excited to have the support of Nordstrom, our anchor tenant, who will generously be dressing our winners for their Holiday Parade debut. The Community Christmas Tree again is made possible due to sponsorship of Consumer Fire Products Inc. The tree will be installed at 9 a.m. Tuesday, Nov. 20, in the 1300 block of State Street. The public is invited to join Downtown Santa Barbara for this tradition. Other Holiday Parade sponsors: American Riviera Bank, Hotel Californian, Kimpton Canary Hotel, Lemos Feed & Pet Supply, LogMeIn, Los Arroyos Mexican Restaurant & Take Out, Marborg Industries, Montecito Bank & Trust, Noozhawk, Paseo Nuevo Shops & Restaurants. Santa Barbara Beautiful, Santa Barbara Independent, Santa Barbara International Film Festival, The Eagle Inn, The Towbes Group, Union Bank, VOICE magazine, and Zoom Video Communications. The 66th Annual Downtown Santa Barbara Holiday Parade, Presented by Consumer Fire Products Inc. runs along State Street from Sola to Cota streets. For information about volunteering for the Holiday Parade, or participation in the Prince & Fairy contest, contact Lisa McCorkle, Holiday Parade producer, lisamccorkleflp@gmail.com; or April Lee, DSB marketing/events coordinator, April@DowntownSB.org. Downtown Santa Barbara serves as the champion and advocate for the merchants and property owners of the downtown district in Santa Barbara, California, with more than 1400 members. — Kate Schwab for Downtown Santa Barbara.